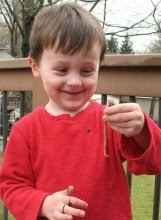 We found an earthworm and I was really proud of myself for not going "eek" when I uncovered it in the dirt. Not only did I not shriek, but I feigned excitement and got my kids to be excited about it. My 2 year old tried to eat it (you have to watch her)! My son was enthusiastic about holding it. When he found out that you use them for fishing he said, "Oooh, I'll put it in my pocket so Daddy and I can bring it fishing." Hmmmm, guess I better start checking his pockets. He was very concerned that the birds would eat it if he didn't keep it. We found a nice hiding spot behind some flowers. Despite the fact that I lack a green thumb, we bought some flowers at Wal-mart yesterday to plant in our front flower gardens. My kids were so excited! I even splurged and got them each a mini watering can. Does it get better than that? We spend several hours out front weeding and then planting and then, the best part, watering the flowers. We saw our neighbor who is about 6 years older than our son and my son eagerly invited him over to join us in our weeding. He kindly obliged and when he went to his shed to go get his tools my son admonished me to slow down on the weeding. "Mom, don't pick all the weeds. We don't want to run out. We need to share them with Tommy." This made me chuckle. Running out of weeds isn't a problem I have ever experienced in my limited time gardening. The flowers we were planting were called Impatients. Seemed appropriate as throughout the afternoon the conversation went something like this. "Mom, are you done weeding yet? Can we plant the flowers?" "Now, can we plant the flowers now? I am ready to water them." "Hey mom, is it time now to plant the flowers? I got my watering can." "Hey Mom, can we water them?" "When is it time to water them?" "I'm ready to water them." Finally we got them all planted and then they got to water them. It was pretty cute watching them pour the water from their cans. 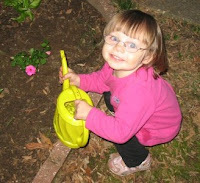 I also loved watching my daughter pat the soil around the plant... something about those tiny little hands patting down the soil, it was like a Hallmark moment or something. Don't forget the baby. About half way through the process she decided she didn't want to be left out and she joined us, sitting on my lap. Digging the holes one handed was a bit slow, making the process take even longer. It was close to dark when we finished. This morning when the kids woke up, my son told us he was so excited to look out the window last night to see his flowers. THIS is the part of gardening I enjoy. He also thought the flowers were thirsty and would need watering again today. Perhaps these plants have a better chance of survival than the last flower I brought home. 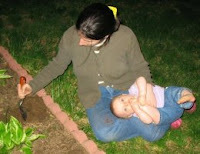 Maybe green thumbs skip generations. As I read this to my husband we laughed out loud. Thanks for the -warm fuzzy- moment.